Born from the bestselling book that went viral, comes the hilarious calendar you didn't know you need-ed. 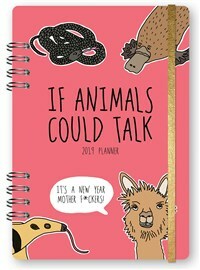 "If Animals Could Talk" creators Carla Butwin and Josh Cassidy use their playful artwork and witty writing to dive deep into the (mostly) dark minds of your favorite animals. So hang it up and make your co-workers jealous, your parents disappointed, and your kids question things you're not prepared to an-swer. Don't say we didn't warn you. And like most strong independent female marsupials, it features an inside pocket! Not to mention spiral binding, a binder band, tabs and two pages of super cool stickers because STICKERS! Carla Butwin is an artist and illustrator from Detroit, MI. By day, she works as an Art Director creating advertising campaigns for brands like Oreo, Hanes, and is currently working on a product launch for a new cracker (shhhhhh it's top secret). Her work has been featured on Advertising Age, BuzzFeed Animals, and The Huffington Post. By night, she's sleeping. She currently resides in Brooklyn, NY where she collects various plush toys, and spends her time doodling animals and listening to crime podcasts. Her other passions include making pasta, seeing films and art shows, and ogling dogs on the street. - Josh Cassidy is an award-winning creative from Detroit, Michigan. He's created advertising campaigns for an array of brands including Taco Bell, Hyundai and Vans. Josh's work has been covered in places such as Fast Company, The New Yorker, Mashable, and has been viewed everywhere from Times Square to the Super Bowl to the front page of Reddit. A member of Film Independent and Los Angeles County Museum of Art, Josh is also passionate about film, art, sports, music and pretty much everything creative. His other hobbies include eating breakfast, going to concerts, playing basketball, pledging allegiance to his Detroit sports teams and unapologetically calling soda, "pop" (no, you're weird).